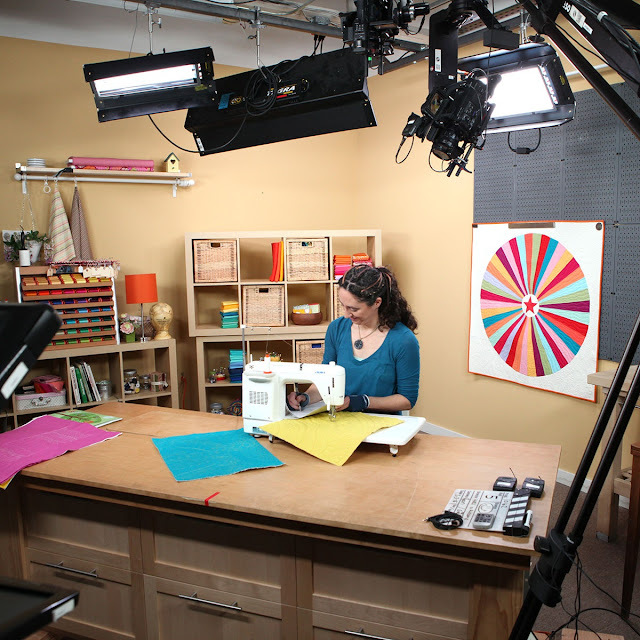 When Christina Cameli, of A Few Scraps, first announced that she had just filmed her third class with Craftsy, I was so excited! 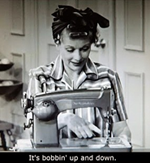 I had gotten a glimpse of the free spirited, improvisational direction she was taking lately with her quilting and so hoped that was what her class was going to be about. Much to my delight, it was! 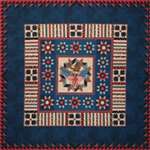 The class is called "Wild Quilting" and it is a joy to take! In Wild Quilting, Christina teaches you how to get creative with free-motion quilting and how to quilt in a freer, more organic way. 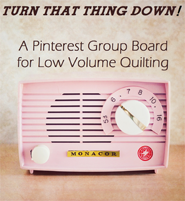 You don't have to be an experienced quilter to benefit from the class. Christina takes what look like the most complicated designs and breaks them down into very doable steps. Take it from me: I was the biggest free-motion quilting scaredy cat before Christina came along. 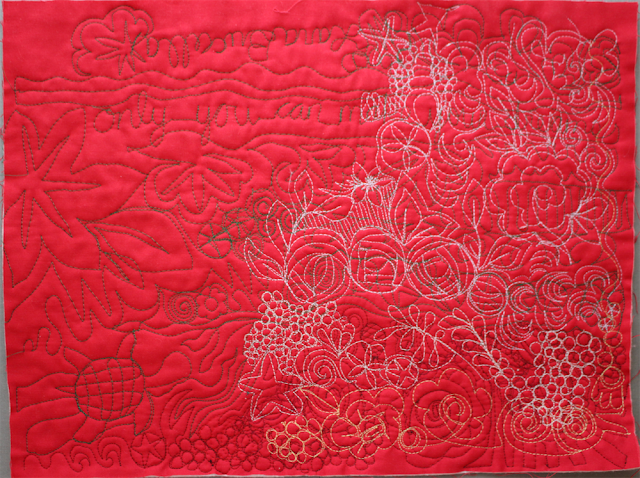 Her free-motion quilting lessons, through her books and classes, have made me so much more confident! 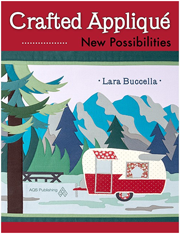 Christina has a gift for teaching quilting in a very encouraging and easygoing way. She fills you with a "Can do!" spirit! I loved all of Christina's Craftsy classes, but most especially Wild Quilting! It's my favorite Craftsy class yet. She does such a great job communicating and showing us how to put together what look like incredibly complex designs, by building on skills and knowledge step-by-step. My husband Jim even came in and sat and watched part of the class. He thought is was really cool! It seems so much more natural and fun to quilt this way. 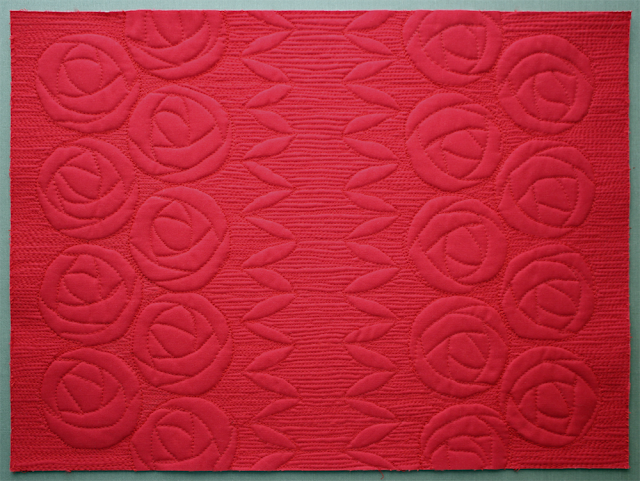 By learning how to divide and conquer a space, quilting becomes less intimidating and much more manageable. The only problem I had is that it got so exciting at times that I had a hard time sitting still and learning, because I wanted to jump up and go give it a try. But that is part of the beauty of taking a Craftsy class. You can hit "pause" and go try out what you just learned and then come back and watch anything you want all over again. When I was a student I used to cover my folders in designs like this, so I hoped to be able to do that with a sewing machine and fabric instead. Thanks to Christina, I now can do that! My first Wild Quilting practice sandwich - Messy, but fun! It looks a bit too structured and that is probably because I drew the roses on with chalk first. (Which is perfectly fine to do.) One thing that Christina teaches, which I should have done around the leaves, is to echo quilt around your design to give it more emphasis before filling in the background. My rose practice piece isn't perfect: my designs are wobbly and my stitches are not nearly all a uniform length, but I like it a lot! I think I might make this panel into a small zippered case, by folding it down the middle, with roses on each side of the case. This piece was a lot of fun to create. Again, you can see that it isn't perfect, but I like it a lot anyway. After taking Wild Quilting, I'm a braver and more confident free-motion quilter. 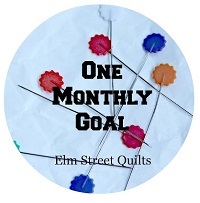 Wow - I just wrote that I'm a free-motion quilter, which is the first time I've ever thought of myself like that. It's pretty exciting to realize that and to think I can handle quilting some fancier designs now! 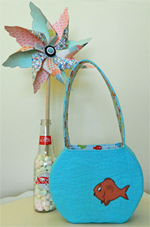 How to create stitching combinations that fill the space organically. How to sew a travel stitch to take you where you want to go next. How to echo stitch your designs to give them greater impact. 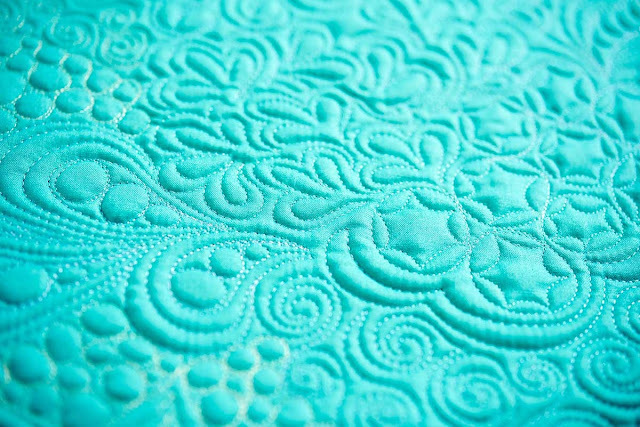 How to vary the density of your quilting to make the various parts of the design stand out. How to divide a space and fill it with motifs. How to handle awkward spaces. How to combine motifs in clusters and choose motifs that compliment each other. How to choose the right scale. How to create focal points, or "showboats". How to create layered designs. Tips for creating your own unique quilting motif "recipes". I highly recommend every one of them! 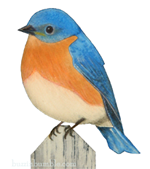 Now I should also say that, even though I am sort of a Craftsy affiliate, I have backed off of doing it for now. I'm reviewing this class purely because I love Christina Cameli. Therefore, none of the links I've provided are affiliate links. 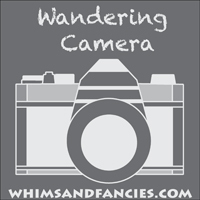 If you do think you'd like to take "Wild Quilting" it would be really nice if you find one of your other blogging friends who is an active affiliate and click on one of their links and then enroll in Wild Quilting. That way they can earn a small commision. You will be so glad you did! Practice pieces?! They are amazing Lara! Every year I say I need to get practicing and I don't. This is so inspiring, I definitely need to! Did she explain how to do all of this on a full size quilt? I can do more with a smaller practice piece, but when it comes to squashing a bigger quilt through my DSM, I get all tangled up. Your pieces look great! Wow! I should aspire to be as good as you. Your Macintosh roses are lovely and the ocean scene is so beautiful. You should be so proud. I must check out the class now. Your practice pieces are beautiful! Your quilting on the practice pieces is lovely. I love the idea of "showboat" motif! That makes a lot of sense. I love your ocean themed piece. You are definitely a 'Free Motion Quilter'. I really liked her class too. Wow! Pictures really are worth a thousand words, and these sample photos just speak volumes about this amazing technique! I can't wait to see the rose piece made up into a pouch or other pretty project! Amazing stuff here!!! I've been pondering taking this class, and I think you have convinced me. I love your idea for dark and then light thread. I will have to share that in my next class I teach. 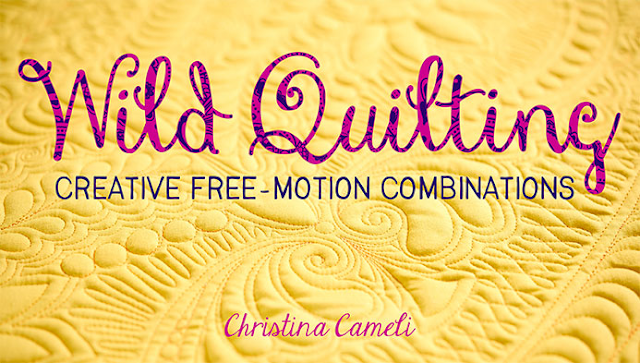 I am so glad you call yourself a free motion quilter, because your practice pieces deserve to become something. They are beautiful! I really like your two colors of quilting. It is frugal, which appeals to me, and the two colors makes it look like graffiti. This class is officially on my wishlist! Those AMAZING practice pieces will make fun projects, what a great idea. A beach tote perhaps? Hope to see the sea turtle again too, he is charming! I HAVE this class, but just haven't found the time to sit down and watch it. I can totally relate to getting up and running to try the stuff right away; might've done that with some of Angela Walters' classes, and then got carried away and didn't go back to finish the class! The beauty is, I can pick right up where I left off even if it was months before that I left off. Lara, even your "it ain't pretty" first piece is awesome, really, and what a great idea to go over the first layer with a lighter colour of thread! Oh, how I love (as you knew I would) that ocean-themed piece! And yes, I have learned the importance of echoing. Thanks for the review to remind me to watch and then do (and then maybe review, wink) this class. I have taken her Wild class and loved it! I have one of her books and love it! Yes practice does help a ton! Your wild roses and ocean scene are awesome!! Wow, Lara, those are amazing "practice" pieces. You will need to make them into something. Thanks so much for a great review. I am always terrified of that divide and conquer aspect of machine quilting. Great work, Lara...You are a free-motion quilter, for sure! Lara, even in your 'not to pretty' piece, your quilting motifs are excellent! All your practice pieces are beautifully done! 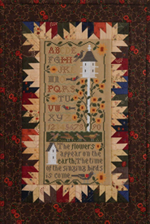 The lady's quilting is gorgeous. I've added the course to my wish list. Your roses would make a chic and sophisticated zippered pouch. Your ocean quilting is... wow! I'm too stunned by its beauty to notice any imperfection. 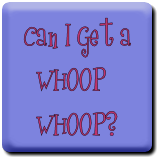 I pinned it in my Quilting board. Christina is such a talented quilter and great FMQ Teacher. Great review. I'm definitely looking forward to checking out her new class. Absolutely love what you created. 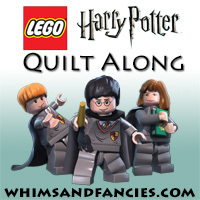 After your review, I'll have to check out Wild Quilting. 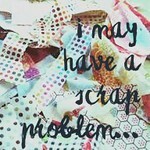 We can always use more ideas and help creating FMQ. Thanks, Lara. Thanks for the information on these classes. I need all the help I can get! I, too, think your practice pieces are gorgeous! Maybe one day I'll be able to fmq like that. Beautiful! I will definitely keep this class in mind when I'm done with the one I'm working through right now. (I keep forgetting to finish it.) I love Christina Cameli's work, so I know I'd like her class. Thanks for sharing so much information about it. But, oh my, look at YOUR work!! Gorgeous. The roses might not be exactly wild quilting, but they are stunning! I really like the ocean themed quilting, too, with the waves and ripples in the foreground and background. And what a great idea to quilt over something you've already done for practice. You definitely ARE a free-motion quilter, Lara! Thanks for this great review of Wild Quilting! I want to take this class! Unfortunately, I'm not familiar with which bloggers are affiliated with Craftsy. Could you point me to someone? I would love to help out a fellow blogger. Nevermind! I found one! Off to buy that class! 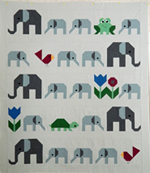 Wow, Lara, you did great with your wild quilting! I just love the technique, and I think it's important to remember that it isn't supposed to be perfect - it's supposed to be WILD! Have fun!! Very pretty! That rose piece is perfect for a case! Nice job on the the ocean scene too! Oh my gosh Lara, your quilting is so neat!! Looks like you are really having fun with that class! I never thought about using different colours of thread to make a practice piece usable again! What a brilliant idea! Your quilting looks amazing and are certainly worth making into something. I think the roses piece would look lovely as a pouch of some sort. Wow! You most definitely are a FMQ'er, Lara; these pieces are great! I love the idea of Wild Quilting - maybe one day I'll even give it a try - and look forward to seeing more of it from you. 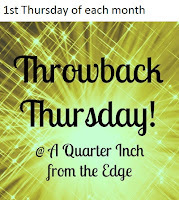 Thanks Lara, I ran on over to Craftsy to check out the sale and came out with one of her beginning classes. Looking forward to starting. TFS! Hi Lara, I really love your ocean practice piece. I have taken Wild Quilting also and it's one of my favourites. I always knew your were a "wild" woman Lara!!! You are so talented. I am soooo jealous! tree, waves, sun and many extra things on my Hawaiian quilt. 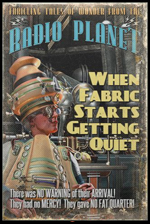 As I do love drama in the quilting. Oh I hope you did Julie! That all sounds so fun! I'm replying here because your comment came in to my email as a "no-reply comment". Thought you might like to know. 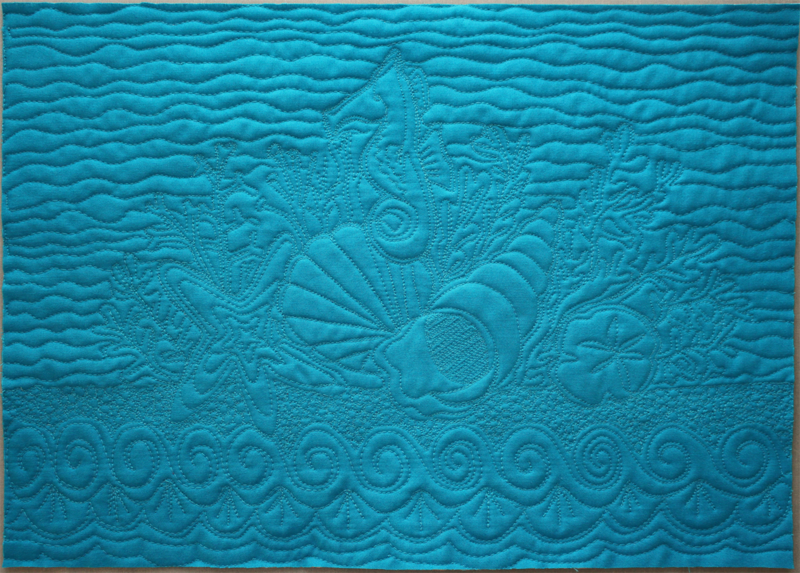 I'm loving this class but haven't gotten as far as you yet in the quilting - love the sea scene! Another awesome review, and I'm ready!